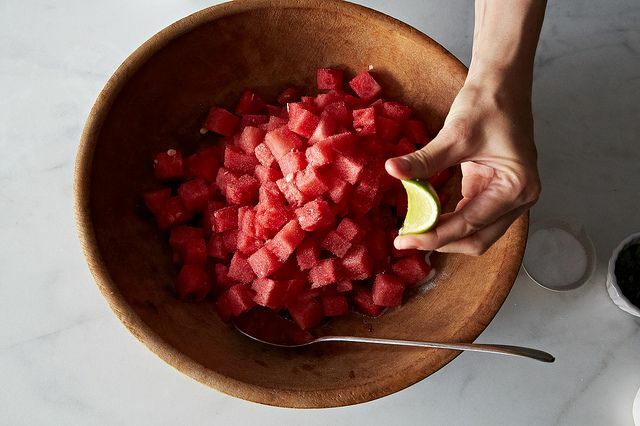 Today: Amanda shows us a new take on watermelon tomato salad. The first time I tasted watermelon tomato salad was in the late 90s at a steak house on the Upper East Side, not a place you expect to meet much innovation. The salad was a pile of yellow and red heirloom tomatoes with watermelon chunks and a bracing vinaigrette. Of course two outliers -- the vegetable that’s technically a fruit, and the fruit that chefs consider barely a fruit -- would become fast friends. Together they're a luscious, addictive duo. The salad, which was new and enlightening then, has become idiomatic in summer, the chatty cousin to more buttoned-up caprese. Its variations have also become familiar: there’s the feta and mint number, the sweet vinegar iteration, and the goat cheese variation. Recently, though, I came across one that was utterly divergent from any I’d had before. 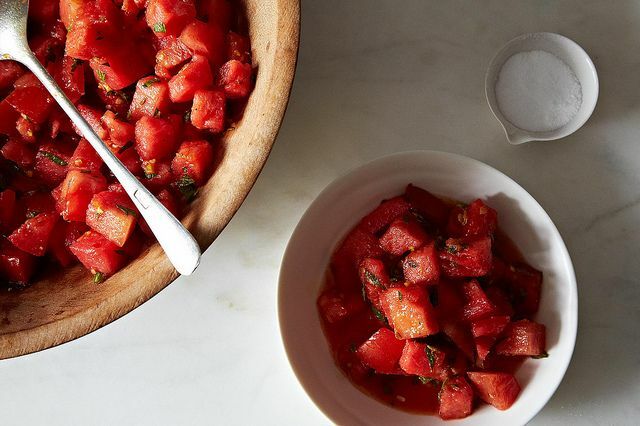 Watermelon tomato salad, there’s room for invention, you’re not out of the game yet. 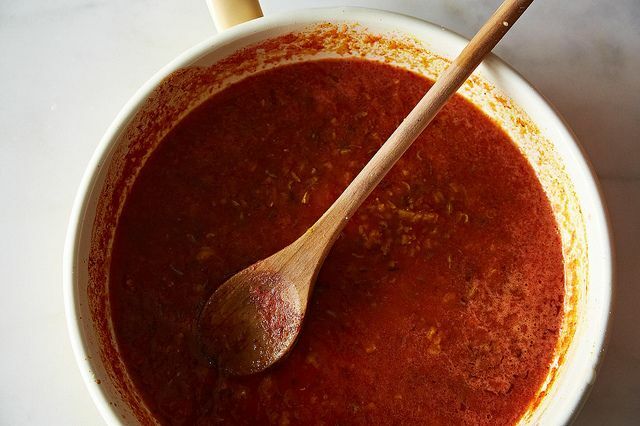 All you needed was a little cumin, fennel, and chile to spice you up! 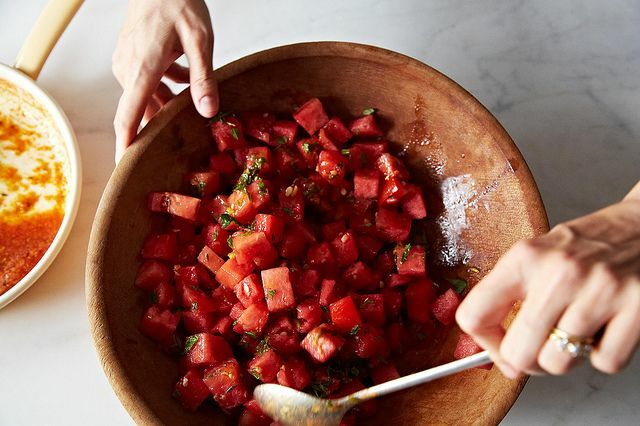 I had this revelatory spiced watermelon tomato salad at a dinner hosted by Kitchensurfing, a marketplace for chefs that gives people access to great restaurant cooks and chefs for private events. One of their chefs, Surbhi Sahni, cooked a stunning Indian dinner that evening, and she served the salad as an intense, refreshing first course. Surbhi, who owns the bakery Bittersweet NYC, and does gigs with Kitchensurfing on the side, first had the salad in Rajasthan. There, she said, a watermelon-only version is a traditional dish and is eaten with plain roti and a variety of other yogurt, lentil, vegetable, and rice dishes. The watermelon is seasoned with citrus and salt, and cooked in a hot curry sauce. 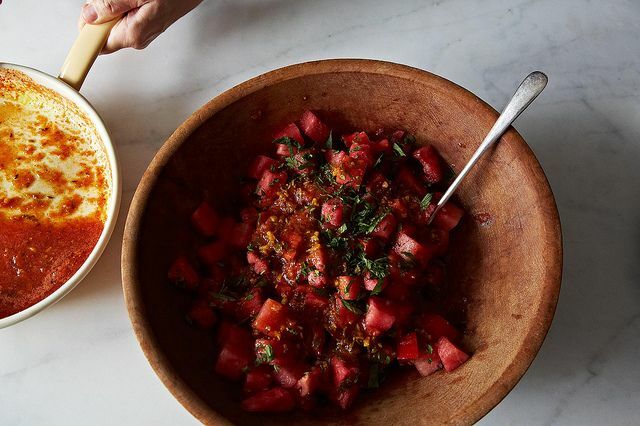 In Brooklyn, Surbhi adds tomatoes, and makes a curry sauce separately, with cumin, fennel, chile powder, watermelon juice, and citrus, then mixes the sauce with the two fruits, and serves it as its own course. No one will snicker if you show up with it at a potluck. You may also consider it for your work lunch. And I'd definitely show it off at a dinner party. 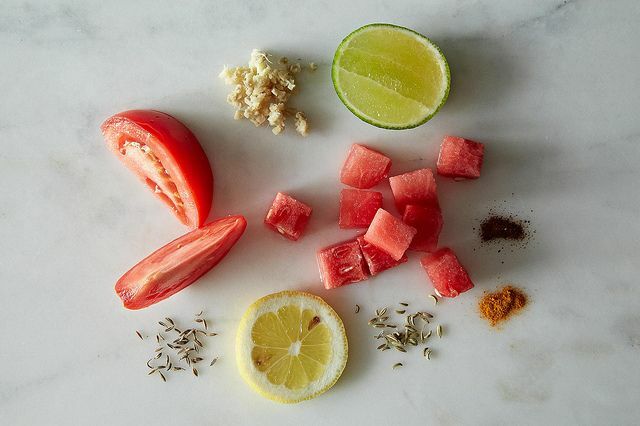 And now that I have permission to add spices to my watermelon salads, I may even go rogue and try curry leaves and mustard seeds. Superb. Tomatoes are sooooo in season here and we've all fallen in love (by we, I mean the kids....) with watermelon. This is a variation on my baked watermelon version - a wedge, lined with mint leaves, topped with crumbled feta and finished with Lior's Ararat No 35. Heaven. Thanks Kitchen Butterfly -- hope you like it.